a&o Frankfurt Galluswarte i Frankfurt, Tyskland: Bestill nå! 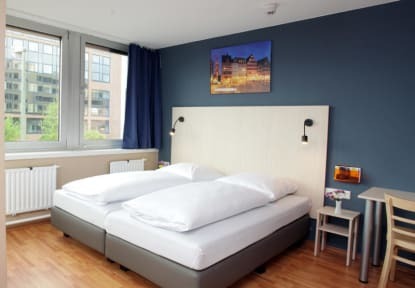 The a&o Frankfurt Galluswarte enriches the Hessian metropolis with its modern rooms at a very affordable price. You can choose between a single, double or family room. Our numerous shared rooms in the hostel area offer comfortable beds plus separate shower and toilet in the room. We are excited to welcome you at our a&o in the stunning 'Chicago' on the Main! The a&o Frankfurt has a prime location for all those who are travelling to the city for business or personal pleasure. With just 1 km from the main train station and congress centre the a&o can easily be reached with public transport. Using the S-Bahn or tram station Galluswarte, guests land right on our doorstep. Car drivers can park their vehicle on a&o's own car park. With such a dreamlike skyline the a&o Frankfurt Galluswarte (Messe) naturally offers its guests its very own 'uplifting' experience! The SkyBar on top of a&o's roof makes the 'sparkle' by day and 'brilliany of colour' by night visible: Come and enjoy it in good sociable company from all over the world and with well-mixed drinks in your hands! Bed linen are included in private rooms. However, when you book a bed in a dorm room, we do charge €3.50 per bed per stay extra. Towels are included in private rooms also. If you stay in a dorm room, you can rent a towel for only €1.50. Every morning from 6:00 till 10:00 am (7:00 till 11:00 am on the weekend) we do offer a breakfast buffet, which includes e.g. several sorts or bread, cold cuts and cheese, fresh fruits, cereals and eggs, for only €7.